Vacationers know Wisconsin Dells as the “Waterpark Capital of the World,” but it is much more than that. We all love to splash around at the waterparks, but don’t forget about the scenic destinations around the Wisconsin Dells area. So cheers – cheers to exploring the beautiful Wisconsin Dells area. 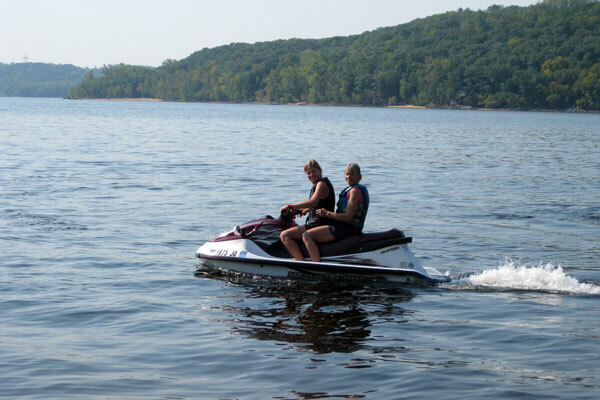 Here are a few recreation ideas in the Wisconsin Dells area that our team has enjoyed. Be sure to scroll to the bottom to view some great Dells vacation rental properties. Drive. Splash. Cruise. How awesome is that? No matter the age, the Duck tours are ideal to view the area. This exciting tour has been around for nearly 70 years. 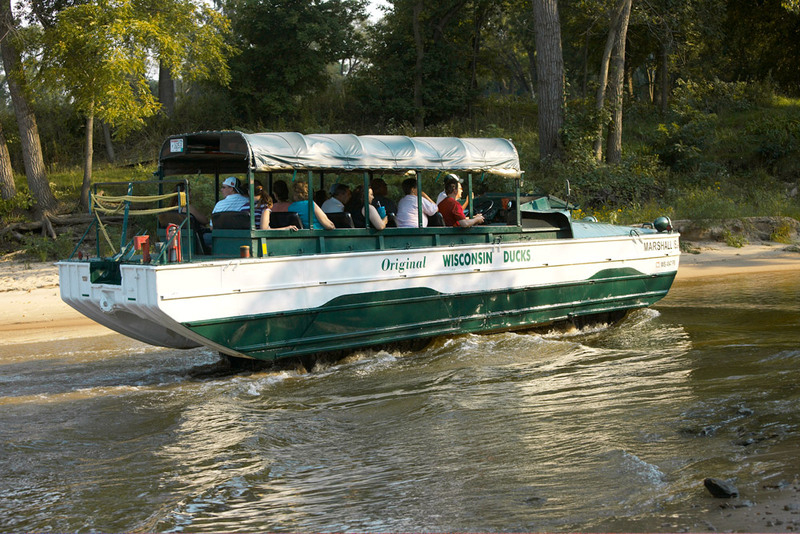 You’ll explore the Wisconsin River, Dells Creek, with a final splash in Lake Delton. We have talked to many vacationers who frequently visit the Dells area who make this a regular visit. Here is more information on the Original Wisconsin Ducks. Thinking about being in the area during the summer months? Great! There are plenty of options to explore the local lakes. Castle Rock Lake is an extremely popular lake that our vacationers visit. In fact, view our Interactive Wisconsin Map and scroll to the Dells area to view all of the properties on this lake. We aren’t joking; there are plenty of options. Plus, there are plenty of watersport rentals available on Castle Rock Lake: pontoons, waverunners, kayaks, and paddleboats. After all of the fun in the sun, kick back and relax. 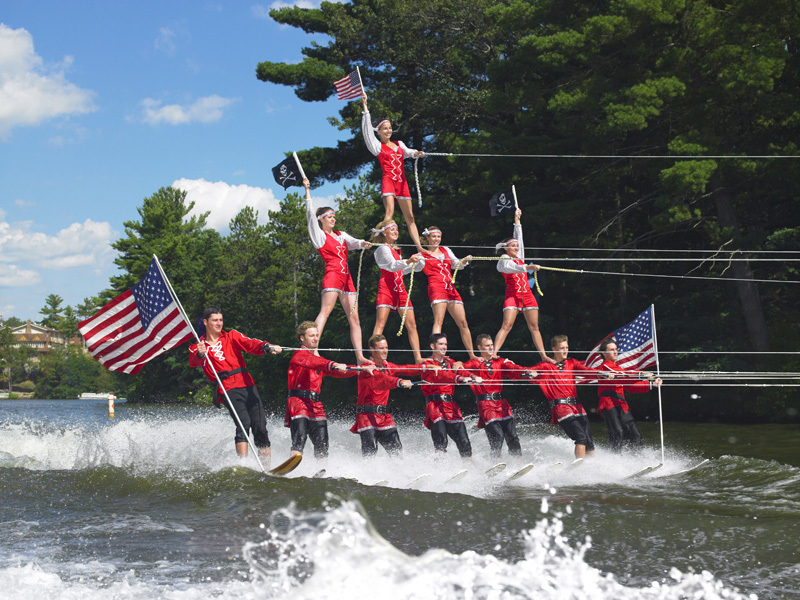 In 1952 the Tommy Bartlett Water Ski & Jumping Boat Thrill Show began with its first show near Chicago. Their second show in Wisconsin Dells was such a hit that the team was asked to stay. Since then, the show has continued to be a hit. This takes water recreation to an entirely new level. So, let’s start the countdown to the end of May. Spring Brook: Americana Cabin on the golf course & walking distance to the lake. The four bedroom home offers enough space to sleep up to 10 vacationers. The ranch style vacation property offers plenty of living space. Downstairs, vacationers enjoy the fantastic family room which includes a wet bar, foosball table, and two bar tables. Come, enjoy the fun! Check out this gorgeous interior at Sand County: Herons Landing. The lakefront vacation home is on Lake Delton. Like one can tell from the above photo, the interior design at this home is unmatched. The living space features a wood burning fireplace and a modern, open-concept kitchen. Bring your family and friends; this home sleeps up to 14 guests. The Cottage Keeper: Lakeside Lodge is on Castle Rock Lake. The outdoor amenities draw in many guests to this spacious vacation cabin. Relax in your screened deck or out on the stone patio – all with great views of the lake. By evening, gather around the campfire pit to enjoy a crackling fire with roasted marshmallows. Our website lists over 100 vacation rentals in the Wisconsin Dells area. Be sure to check them all out. Questions? Comments? Let our team know. This entry was posted in WI Vacation Destinations, Wisconsin Vacation Rentals and tagged Cabin, travel, vacation, WI travel, wisconsin, wisconsin dells. Bookmark the permalink.